Jack Reed is the senior U.S. senator from Rhode Island (D-RI). 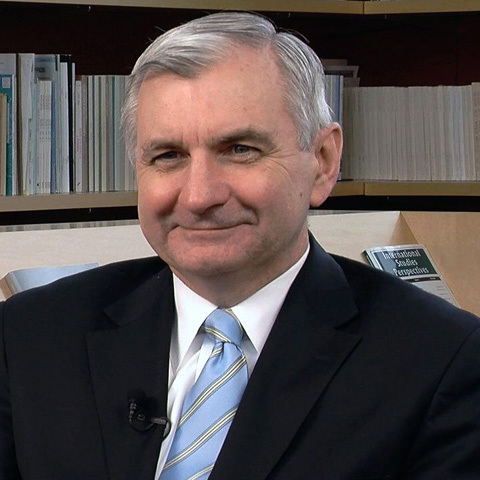 Prior to his election to the Senate in 1996, Reed was a three-term member of the U.S. House of Representatives from Rhode Island’s 2nd Congressional District. He is a leader on defense, education, and health care issues and is a member of the Armed Services Committee and the Appropriations Committee. After graduating from West Point, Reed attended the John F. Kennedy School of Government at Harvard University where he received a Masters of Public Policy. An Army Ranger and a paratrooper, he served in the 82nd Airborne Division as an Infantry Platoon Leader, a Company Commander, and a Battalion Staff Officer. He returned to West Point in 1978 as an associate professor in the Department of Social Sciences. Reed received his J.D. from Harvard Law School in 1982 and worked as a lawyer in Washington D.C. and Rhode Island. He was elected to the Rhode Island State Senate in 1984 and served for three terms. What was H.J. Resolution 114 and who wrote it? How might the recent events in the Middle East and North Africa shape U.S. foreign policy?